There are 5 gorgeous cards, with prints taken from our very own dress collections. 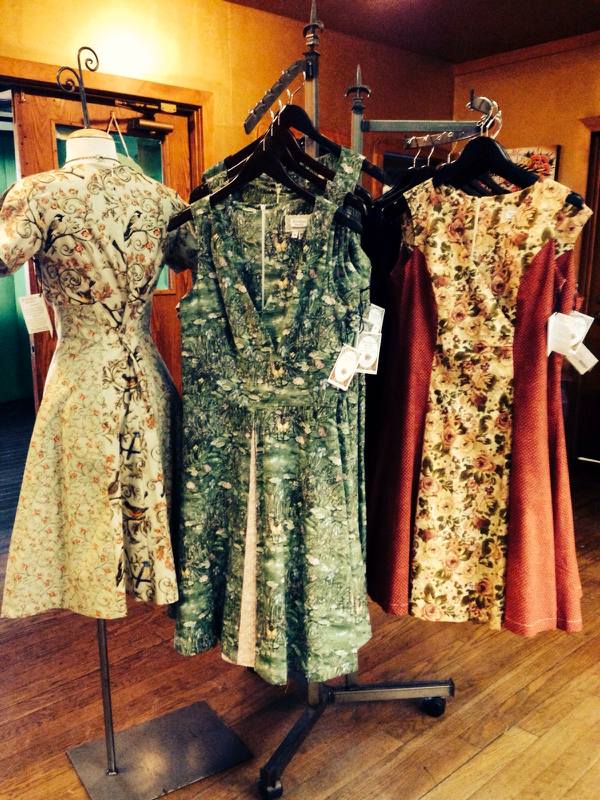 The Five styles include The Red Floral, The Lily Pond, Swirling Birds, Light Rustic Wood, and Nautical Dark Wood. 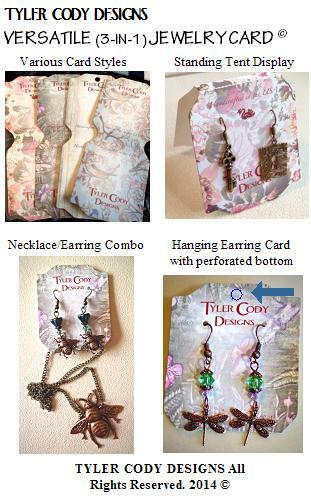 The Versatile (3-in-1) Jewelry Card is copyrighted 2014, and can function as a Standing Tent Card for Earrings, or a Hanging Necklace/Earring Card Combo, or by perforating the bottom middle section, can be hung as an Earring Card. Instructions are included with the new cards, however if you have any questions as to how to best use the cards, please don't hesitate to contact us. The Brand New Versatile 3-in-1 Jewelry Card was designed and copyrighted in June 2014 by Courtney Chapman Darwicki, Owner & Designer of Tyler Cody Designs. This Newest Collection will encompass intricately detailed brass stampings. Designs including Fleur De Lis, Crowns, and more regal designs. Check back in August 2014 to see the full collection online. "I want to let every Retailer of Tyler Cody Designs know how much I appreciate them, and am SO grateful to each and every one with all of my heart. The Business Owners and Buyers I work with are the hardest working people I have ever met! They are visionaries, taking chances based on their beliefs and 'eye for design', just as I do when I create - it is because of their ability to see the bigger picture that I am able to continue with my passion for designing!" Please give me a minute of your time and send me your thoughts on my collections. I embrace ALL feedback, taking every moment as an opportunity to excel. If you have any questions, comments, compliments or complaints, I want to hear from you so Tyler Cody Designs can continue to grow as a company. It's True! 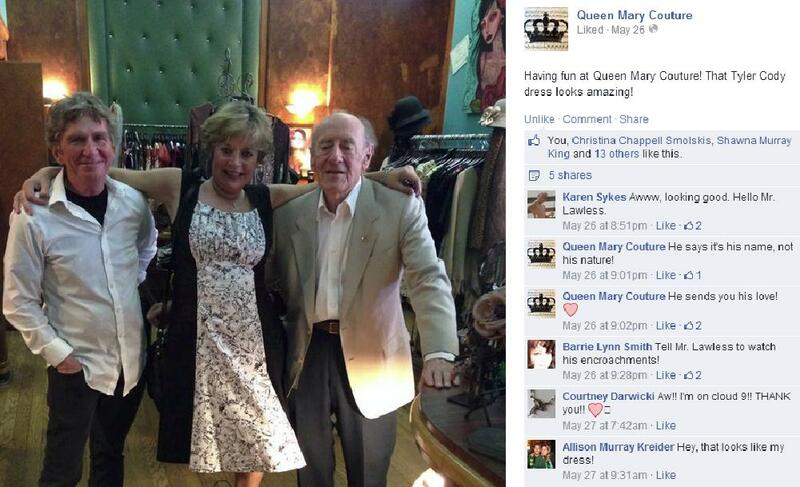 These customers were having a grand ol' time at Queen Mary Couture. 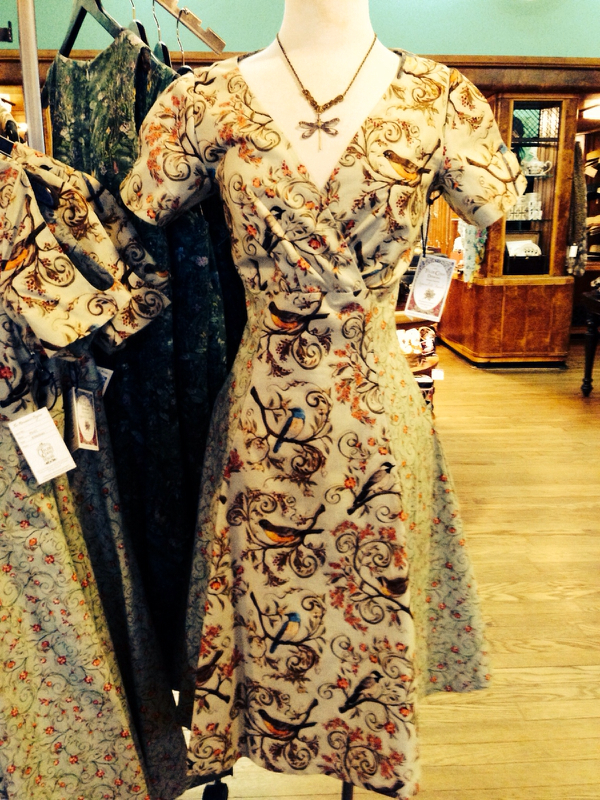 This beautiful lady tried on the Floral Shirred Dress and fell in love they say! Prancing through the store, happy as could be that she found that perfect-fitting dress, which highlighted all her positives! Thank you so much to the Queen Mary Couture for sharing this experience with us! The New Fall 2014 Collection will premiere at Ink-N-Iron Festival on June 6-8, exclusively available through Queen Mary Couture, at the Legendary Queen Mary, Long Beach, CA. Queen Mary Couture now offers Tyler Cody Designs 2014 Dress & Jewelry Collection, and Portside Necessities now carries our Jewelry Collections. Queen Mary Couture is a fusion of trendy style with classic sensibilities, resulting an appealing mix of unique and edgy clothing, funky accessories and chic home décor. Portside Necessities now carries an impressive selection of Tyler Cody Designs Jewelry, located in the Queen Mary Hotel Lobby. From jeans, blouses, sweaters and tees, Queen Mary Couture offers a wide selection of women’s apparel made only from the finest fabrics. Men can find a vast selection of high-end jeans, dress shirts, casual shirts, ties and accessories. Always on the cutting edge and inspired by the fashion, art and music scenes of Southern California, Queen Mary Couture also sells an array of pop culture books, music and home décor, all exemplifying California cool. Sunday – Thursday: 10:00 a.m. – 6:00 p.m. Carrying an impressive selection of Tyler Cody Designs Jewelry, Portside Necessities is located in the Queen Mary Hotel Lobby. Portside also offers a mix of merchandise and guest necessities like toiletries, sundries, snacks, sodas and more. 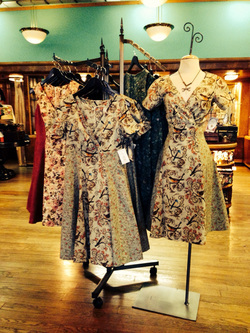 Whether you’re looking for a Queen Mary t-shirt or some candy, Portside Necessities is your one-stop shop. Sunday – Thursday: 7:00 a.m. – 7:00 p.m. It's no secret that the Antique Style Pocket Watch Necklaces have been a nationwide bestseller for ALL retailers. They are an amazingly beautiful and very functional accessory, with japan quartz movement, stainless steel cases and a fantastic variety of designs. They continue to increase in popularity, and price everywhere! We have drastically reduced our wholesale prices for our Retailers, as we keep our promise to maintain the most competitive prices. By increasing our stock, we are able to carry over the savings to you. Take a look and see, the price drop is several dollars on the large & medium-sized clock necklaces and a few dollars on the bestselling small pocket watch necklaces. There they are, in the front rack at Queen Mary Couture... After a year of hoping for a little space, the owner has taken in my collections with open arms and a warm heart, giving them the best location in her store; and turns out she is truly an amazing and beautiful person to boot! I am so honored and grateful, feeling like I have officially become the designer I dreamed of my entire life!! Ever wonder about Sterling Silver, as in looking for ways to offer your customers an investment-style piece such as Sterling Silver, without breaking the bank? Silver-filled is a relatively new material with a high perceived value at a fraction of the cost of sterling silver, AND with nearly all of the same qualities as Sterling Silver. With a layer of Sterling 100 times thicker than plated silver, Sterling Silver-Filled can be cleaned just like Sterling Silver,and with the same lasting integrity yet at a much more reasonable price. So, how is silver-filled different than silver-plated? Silver-Plated: a very thin film of silver DEPOSITED on a brass or copper base. (Tyler Cody Designs does not carry silver-plated jewelry). 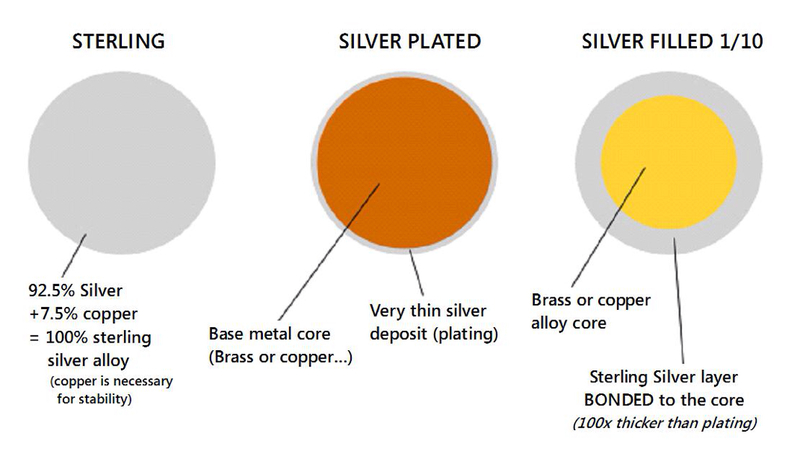 Silver-Filled: a layer of sterling (100X thicker vs. plated) BONDED on brass or copper core. So, what does silver-filled mean for your customer? Jewelry that has the shine, substantial weight and the look of sterling but without the high price. Anyone who can wear sterling without an allergic reaction can wear silver-filled. Silver-filled can be cared for the same way as sterling. Tyler Cody Designs uses only 1/10silver-filled chains which have a thicker layer of sterling, and are anti-tarnish coated for extra protection and countless years of wearability. Available in Okinawa, Japan at select stores. Please contact us for further information. Sunday – Thursday: 10 a.m. – 6 p.m.
You may already know we stock an immensely large variety of Dyed Freshwater Pearls, from A Grades to D Grades, and we just added even more color choices. Whatever your price point or desired quality, we can custom design the perfect collection for you. These small Freshwater Rice Pearls perfectly complement our Blooming Tulip Signature Collection. Dyed gorgeous hues, these pearls add a zest of color to the beautifully detailed Blooming Tulip Collection.